Kitchen! Kitchen! 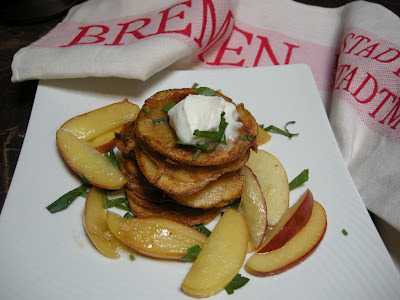 : Mutti's potato pancake.....at kitchen kitchen! Mutti will be so proud! Mutti is mother in German, and it was through my son's grandmother on his father side that I learned how to make potato pancake, rouladen, gruenkohl, and other German dishes that I still make up to now. I usually make them in the fall or winter since these dishes are quite very filling. Her name was Gertrude but I called her mutti, so did my family and friends. The name just stuck and she didn't mind at all being called mutti by everybody, even people she just met. She was one unique lady. She could out climbed you on a 5 flight of stairs carrying luggage on both arms. She was an avid gardener and a wonderful cook. I remember on one of her summer vacations with us, she was going to make this potato pancake and was going to show me how. She asked if I had any lard. A lard!!! I almost fell over. I've never used it for frying. So I tried to explain to her in the best way I can in German, that vegetable oil or canola oil is better for frying. She was old school, so I understood the "lard" issue. She was very hesitant but kind of gave in, but not without giving the bottle of vegetable oil that look of "let's see if you can really do the job" thing. I watched her manually shred 8 Idaho potatoes by hand or was it 12? I don't remember. I was in awe! She does not want the cuisinart shredder. Nothing like the old fashion way, I suppose. She attacked that shredder like the world was coming to an end. And here I am thinking, I will probably end up with bloodied hands doing it her way. But, you know what, I did it with just a few scrapes on my hand on my first try until I mastered that shredder just liked her. There is nothing like being challenged by a whiz in the kitchen. Her birthday is coming up on July 28th. So in her memory and honor, I decided to make potato pancake with a twist and making it my own and hopefully impart it to my daughter-in-law in the future. Way, way future! Danke mutti! Your memory lives on! 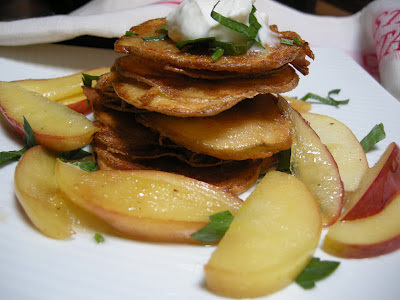 In the meantime my dear friends, family, co-blogger and followers, this is my twist of mutti's potato pancake. Sliced thinly about 1/8" in a mandoline (be very careful in using the mandoline and follow the instruction that came with it). Mix everything in a bowl, and in the meantime, heat some vegetable oil in pan and let the oil come to about 1/4 of an inch in the pan. The oil must be steaming hot. Put together 3-4 pieces of the potato slices doing a free form kind of a thing, like a shape of a star and put in the hot oil until brown and crispy and flip on the other side and do the same thing. Tip: wait for the sides to brown before turning each piece over. DO NOT crowd them, do 3 or 4 at a time so as not to steam them. Drain on paper towel and set aside. Do this on the same pan but make sure you remove the oil, add the butter, apples, sugar, salt, lemon juice. Stir to mix until the apples carmelizes. Make sure the apples do not get all mushy.